• Tremendous capacity is capable of covering 12 acres in one minute (49,000 square meters per minute). 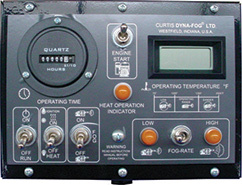 • Curtis Dyna-Fog Model 49000: 9.5 HP Kohler Engine; Factory Price is $16,999.00, not including freight. OCP&E® sale price is $16,500.00 delivered. • Curtis Dyna-Fog Model 49000-3: 10.5 HP Honda Engine. Factory List Price is $17,489.00, not including freight. OCP&E® sale price is $17,000.00 delivered. • Curtis Dyna-Fog Model 49000-22: Yanmar 10 HP Diesel. Factory List Price is 19,403.00. OCP&E® sale price is $18,999.00 delivered.